The Episode starts with Preeto coming after Raavi. Soumya asks what happened? Preeto says we are tired. 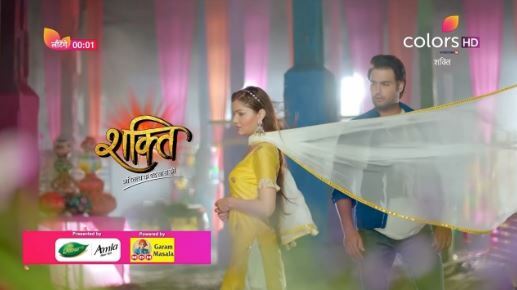 Soumya tells Harman that everyone is tensed. Harman asks her not to worry and have food. Soumya worries about them. Shanno asks Veeran not to worry and tells that Sukha’s enmity is with Harak Singh and Preeto. Sukha calls Veeran and calls him partner. He says you are my partner in crime. He says we had stolen toys from the shop and I was jailed. A fb is shown, Sukha kills the man who catches them red handed and tells that he will complain to harak Singh, but Sukha kills him. Harak Singh comes home and tells about Sukha’s threatening him in the factory. Preeto says he can go to any extent. Veeran asks Harak Singh to get him arrested. Harak Singh asks why are you tensed? Veeran says nothing and thinks how to tell you that I was his partner in crime and he will not leave me. Harman comes to Soumya and asks how is he looking? He says you are not caring about me and not seeing what I wore. Soumya says it is not like that, I am taking care of him as he is small and dependent on us, so have to care him extra. Harman says even I love Soham, but feel bad to share my love. Soumya says my love for Soham is motherly love and for you it is different, so don’t worry. She says you are my life. Harman asks baby not to trouble mummy. Baby does potty. Soumya asks him to bring diaper. Harman goes out. Soumya hears Preeto telling that they shall not tell anything to Soumya. Sukha comes to his house. His wife opens the door and does his aarti. Sukha holds her hand and keeps her hand on his head and asks you stayed without me for 10 years, and asks if she cried even a day. She says no and swears on him. Sukha asks where is my son Gurmeet and asks did you make him strong. His wife tells that Gurmeet went to do wrestling and says he has come. Gurmeet comes and is about to touch his feet happily, but Sukha pushes him and starts beating him with a hockey stick and asks if he is feeling pain. Gurmeet says he felt the pain of staying away from his father for 10 years and that pain is more than this pain. Sukha hugs him and says I want to know if your mum made you strong and competent to face Harak Singh’s son. Preeto thinks I can’t let Sukha ruin my happiness and thinks to talk to him. She leaves. Soumya sees her going. Preeto reaches Sukha’s house and knocks on his door. Sukha opens the door, looks at her and is about to close the door, but Preeto says she needs to talk to him. He pushes her. Soumya holds Preeto. Harman comes and stops Sukha from closing the door and says don’t raise your hand on my mum. Sukha says you have seen that I pushed her, but didn’t see that she along with her husband sent me to jail for 10 years. Harman says Mama…Gurmeet comes and holds Harman’s hand. He says I have heard many stories of your bravery and if you dare to see at my hand then I will make mince out of you. Preeto and Soumya ask Harman to leave him. Sukha asks him to keep his anger in control. Preeto says nobody will come between my brother and me. She tells that your anger is always high and that’s why you had to spent 10 years in jail. Now start a new life. Sukha says you had said that I died for you. Preeto says I used to beat you and you used to sit on the terrace until I convince you. She says you went to pluck guava from the tree for me. Sukha says I remember everything and says you told Babu ji that I went to pluck guava for you. Preeto tells that she was standing with truth then and that time also. She asks him to start afresh and says she will help him. She says if you want revenge then suffocate and kill me, and says Rakhi’s promise that my family will not accuse you for my death. Sukha says you didn’t know what is the price of Rakhi for me and says I am not cunning to kill you with my hands and asks him to go and ask Veeran what was the truth and why he didn’t tell the truth until now. Precap: Soumya tells baby that she will be with him all life and will make his life brighten. She says don’t leave me ever.